The most prominent merchant home in Trinity from the mid-1800s onwards, Slade House typifies the kind of home a powerful merchant would own at that time. 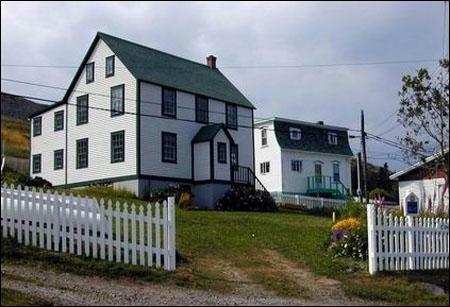 The Slade House is a good example of the kind of house built for the merchant class on the island portion of Newfoundland and Labrador during the mid-19th century. It is believed that Alexander Bremner, an active member in the commercial life of Trinity, had the dwelling built around 1840. He was a partner with Walter Grieve and managed his business in Trinity. Bremner also managed the Slade's Plantation, who were prominent Poole merchants actively involved in Trinity. Judging by the name of the residence, it is possible that they built this house for Bremner. In 1860 Bremner sold the premises to William Hart, who also represented outside business interests in Trinity. In Hart's case, he represented the Ryan family of Bonavista. Subsequently, the house was passed down or sold to a succession of different people who used it as a private residence. In 1902 Walter Hart came into possession of the house. Edwin Grant owned the house in 1909 and Frederick Walters owned the house in 1925. The current owners of Slade House are John and Janet O'Dea, who acquired the house from the estate of Frederick Walters. The house, still a private residence, is located on Old Courthouse Road, which leads to St. Paul's school. Unsurprisingly, because it is a merchant residence, it is located on one of the highest points of land in the area and looks down on much of the surrounding community. Slade House is a wooden two-and-a-half-storeyed structure with a peaked roof and a two-storeyed linhay in the rear. The house also has two chimneys. The design of the house is not unlike that of Campbell House, further emphasising the fact that the house was probably built before 1850. Prior to its purchase by the O'Dea's, the house was in basically good shape, but in need of repairs to the roof, chimneys and windows. The house is now in excellent condition. The Slade House was recognised as a Registered Heritage Structure in November 1989 and was presented with a commemorative plaque by the Heritage Foundation of Newfoundland and Labrador in July 1998. Also view the Slade House Registered Heritage Structure on the Heritage Foundation of Newfoundland and Labrador web site. The Newfoundland and Labrador Heritage Web Site has on its site only a portion of the registered heritage structures in Newfoundland and Labrador. To view a complete list or search for a particular structure visit the Heritage Foundation's Property Search page.